FEMA Urban Search and Rescue crews from across the country are in the Valley to certify their canines on Phoenix Fire Department’s one of a kind disaster course. PHOENIX — FEMA Urban Search and Rescue crews from across the country are in the Valley to certify their canines on Phoenix Fire Department’s one of a kind disaster course. The Phoenix Fire Department has a unique facility with stacks of concrete, rubble, and abandoned cars. It’s specifically designed to put specially trained canines to the ultimate test. Captain Danny Gile with the Phoenix Fire Department says their rubble field has been engineered to replicate disasters like bombings and earthquakes. It’s an unstable and touchy environment that can put first responders and potential survivors in a lot of danger. That’s where the sure-footed canines and their handlers come into play, like Captain Dana Medlin, a Canine Search Specialist with Arizona Task Force One. 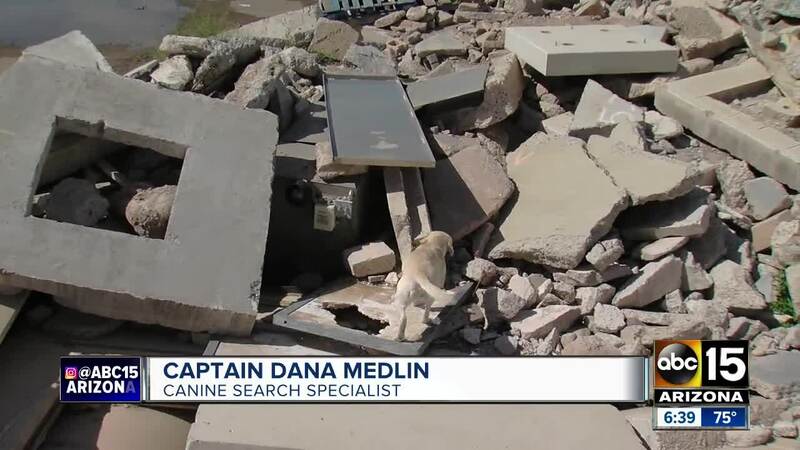 “The dogs could cover this rubble pile in a matter of minutes where it take us hours and with a high degree of certainty that there's somebody in there and where they are to a pinpoint,” said Medlin. To become one of around two hundred FEMA certified disaster rescue dogs, they have to find four to six mock victims in the rubble pile without any false alarms. “Just to get to the point to where they're ready to take the test, takes literally thousands of hours,” said Medlin. But when the highly trained dog makes that discovery, the success makes the countless hours all worth it. “It's one of the greatest feelings because our dogs are our family, they live with us, they work with us every day,” said Medlin. Over thirty FEMA Urban Search and Rescue teams from across the country will be working toward certification in the Valley on March 2 and 3.